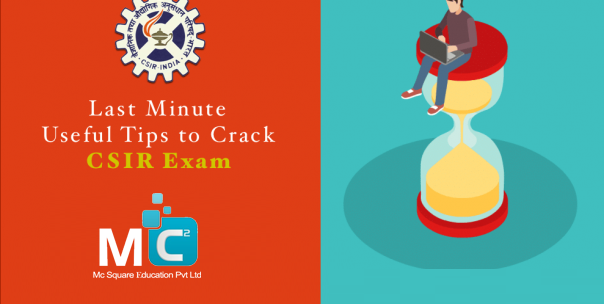 As CSIR / UGC NET (National Eligibility Test) are nationwide exams, you need to prepare for it from the first year. Therefore, it is very difficult to leave with a good score when preparing in just 7 days. Do intensely. Writing skills matter a lot in the NET exam. You should be able to present all information in a logical manner as expected by the examiner such as citing with facts and giving your answer with related topics that highlight your point of view. Follow the curriculum thoroughly. Even if you can not finish all the options given, at least make sure you know some of the concepts in each unit. Sort the NET question papers according to the topics. Prepare a standard answer to the question papers from previous years. This will also make your homework easy on the UGC exam. Do not neglect concepts as they are asked questions of mastery level Sometimes the questions are of a "conceptual" nature, with the aim of testing the levels of understanding of the basic concepts. Get a list of standard textbooks and also articles from successful candidates or other sources and also good selective grades. The right choice of reading material is important and crucial. Always point to the writing section even as you prepare for objective questions. As there is much in common for the study and there is little time for preparation for the written part II exam. Most of the test questions should be answered shortly and to the point. So practice in advance trying to write answers in 300 words (for short answers) or 800 words (type of essay). Try not to cross the word limit and check the time it takes to write the answers. Go through unresolved documents and try to solve them. Stick to the time frame. Speed is the very essence of this test. Therefore, time management is very important. Never be more confident with your writing skills. It is too subjective and behavioral. And try not to imitate others. Develop and follow your own style of writing. Try not to be repetitive and keep a flow in the style of your writing.